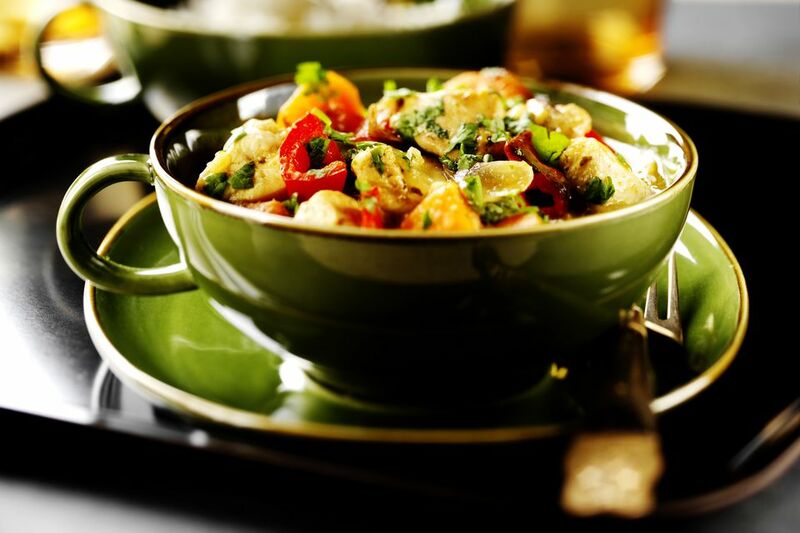 Indulge in a taste sensation with a phenomenal Thai curry. All of these curry dishes are made from scratch, so each one tastes zingingly fresh. They're also healthier than those put together from store-bought pastes and sauces. Cook one up tonight and fall in love with Thai food all over again. This Thai Green Curry Chicken recipe features chunks of tender chicken simmered in a homemade green curry sauce along with healthy vegetables (zucchini and red bell pepper). 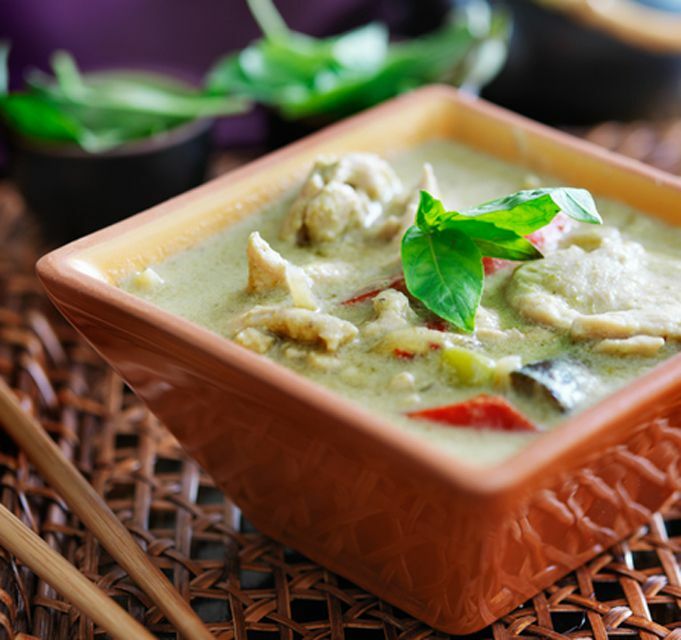 The result is a gourmet-style Thai green curry that is very aromatic and beautiful to serve (great for entertaining). Named after a state in nearby Malaysia, this special curry dish carries with it the flavors and aromas of distant places. You'll find references to Malaysia as well as India and Burma in this delicious dish. With its homemade combination of spices and fresh herbs, my Penang curry is richly flavored, and the red vegetables such as tomatoes and red bell (or sweet) peppers add extra nutrition and texture to this wonderful dish. Thai Red Curry -- Meiwenti, 53 Rue de Richelieu, 75001 Paris, France. This Thai Red Curry Chicken is super-easy to make, and it includes lots of healthy vegetables so there's no need to make an additional side dish of veggies. It is baked in the oven like a casserole, which means it can cook away while you're doing other things. A sumptuous and authentic Thai beef curry that warms and delights the palate. Especially welcome during the fall and winter months, this hearty red curry features deep flavors and a rich finish completed with fresh basil leaves and freshly ground black pepper. Serve it with Thai jasmine-scented rice for a feast of a dinner any night of the week. A classic yellow curry made with chunks of chicken and potatoes just as you would find in the marketplaces and street vendor stands of Bangkok. The use of curry powder (instead of paste) helps the dish come together quickly and easily. Veggie Yellow Curry -- Erb Thai Restaurant. This Vegetarian Thai Yellow Curry is authentic, homemade vegan Thai food at its best. This recipe has been streamlined by nixing making a curry paste; instead, all the minced herbs and dry spices are added directly to the curry pot—a great time-saver if you're in a hurry! And unlike a lot of other yellow curry recipes out there, I don't use curry powder, preferring to add the individual spices for a superior-tasting curry. Give it a try. Thai Lime Leaf Green Curry. For anyone who loves Thai flavors, this curry recipe is a must-try. Made with lime leaves and fresh-squeezed lime juice, the curry paste is extremely aromatic and flavorful. The prominent flavor of the lime leaves distinguishes it from other curries and gives it outstanding taste. An authentic Thai Green Curry Recipe for the vegetarian palate. All the authentic trimmings without the meat, but with meat substitutes - wheat gluten or tofu, take your pick. This recipe is vegan, and you can also choose to make it gluten-free as well. Any way you cook it, this is such a tasty meal, you'll tend to forget how healthy it also is. Gang Pa Thai Jungle Curry. If you like chicken curry, you're going to love this Thai Jungle Curry, a famous dish from Chiang Mai, which is made with ingredients from the jungles of Thailand. Spicy and layered with flavor, this curry is a splendid variation of red curry, but with the addition of a few key ingredients that make it stand out from the curry crowd. This Thai Shrimp Coconut Curry is nothing less than fantastic! The curry sauce recipe is easy to make - just stir together with a few basic ingredients, or blend them up in a food processor, chopper, or blender. The secret ingredient in this curry is a hint of tomato in an otherwise basic yellow curry, which brings the taste up to a new level. Also contributing to this sumptuous curry are pineapple chunks, coconut milk and dry toasted coconut for a tropical-tasting Thai curry you'll want to make again and again. This fish curry tastes so delectable, you won't believe how fast and easy it is—ready in just 20 minutes. Fillets of fish (any type, fresh or frozen) are simmered in a rich Thai curry sauce. It includes vegetables for a healthy one-pot dish. Like all curries, this fish curry makes excellent leftovers as well as hot lunches to take to work. This is a nice dish any time of year, but it's particularly warming during cool weather. Thai Massaman Lamb Curry is a sumptuous dish that's rich in both flavor and nutrients. The curry sauce is made from scratch for the best flavor and freshness. The ingredients list may seem long, but it is actually easy to make—you don't even need a food processor. Just toss all sauce ingredients into the curry pot as you prepare them, and simmer together with the meat. This Thai Massaman Beef Curry Recipe is sumptuous and very flavorful! It's a homemade recipe with no need for any store-bought curry paste or powder. The ingredients list may seem long, but the sauce is quite easy to make—you don't even need a food processor. Just toss all sauce ingredients into the curry pot as you prepare them, and simmer together with the meat. Enjoy! Rendang Shallot and Asparagus Curry. Indonesian cuisine has always been a major influence in Thai cooking. One of the more popular Indonesians dishes in Thailand (and throughout Southeast-Asia) is Rendang Chicken or Beef Curry. Rendang is considered a "dry" curry, which means the sauce is simmered down to a minimum. Because it is so distilled, the sauce sticks to the meat, making this dish one of the most flavorful I have ever tried. And its wide variety of spices makes it extremely healthy. If you like curry, you'll love Rendang. This dish offers the bright colors of orange, yellow, and red vegetables together in a curry infused with citrus accents. You'll love the unique taste of this dish, as well as its healthy combination of vegetables, including pumpkin (or squash), yam/sweet potato, carrots, yellow bell pepper, and cherry tomatoes. Add chickpeas as a protein source, then finish the dish with a sprinkling of pumpkin seeds and nasturtium flowers for a gourmet vegetarian Thai treat that's as beautiful as it is delicious. A fine mixture of spices and herbs go into this supreme beef dish, providing a plethora of flavors in every bite. The dish starts with thinly sliced pieces of your choice of beef, which is briefly stir-fried in oil and herbs, then gently simmered to perfection with the right combination of spices and coconut milk. This dish is bound to please anyone who has a taste for the best in Thai cooking. This famous Thai curry is rich and very flavorful. It is Muslim in origin and can be made with chicken, beef, or lamb. It's a fragrant yellow curry that incorporates lemongrass and nuts together with other key Thai ingredients. Makes a sumptuous dish to serve on a chilly fall or winter night, and leftovers are just perfect for hot weekday lunches. Serve with plain jasmine rice, or, for special occasions, with saffron rice or coconut rice. Thai green curry paste is surprisingly easy to make, and it's so much healthier & fresher-tasting than the store-bought variety. Added to your favorite meats or seafood, noodles, vegetables, tofu, or wheat gluten, this paste will create sumptuous curries. If you enjoy seafood, you'll love this fantastic mixed seafood curry. The recipe starts with a healthy, homemade, rather tart curry sauce that marries well with fish and shellfish. The sauce is heated in a wok or deep frying pan, to which an assortment of nutritious vegetables are added, plus cubes of pineapple and finally the mixed seafood - all of which cook up in no time. It's a healthy, one-pot gourmet delight that will impress your friends and family. Make it as the main course for your next potluck or dinner party—you can expect rave reviews.